The Department of National Defence announced on December 13th of this year that three ships from the China’s People’s Liberation Army (Navy) (PLA(N)) would arrived in Victoria as part of a scheduled port visit. 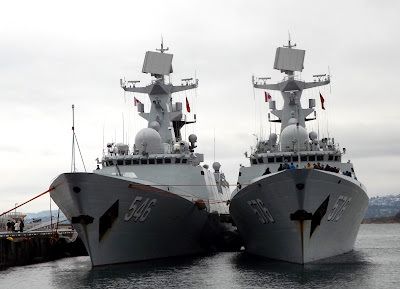 The visiting People’s Liberation Army (Navy) ships consisted of a Type 903 Replenishment Ship, the Taihu, and two Type 054A Guided Missile Frigates the Yancheng and the Daqing. The last time ships from the Chinese People’s Liberation Army (Navy) visited Victoria was in 2006, on this occasion the ships were open for tours on several days of their scheduled visit. It may have come as a surprise to the Chinese sailors to be welcomed by an unusual Victoria snowfall, but at least it will have reinforced Canada’s reputation for serious winters. 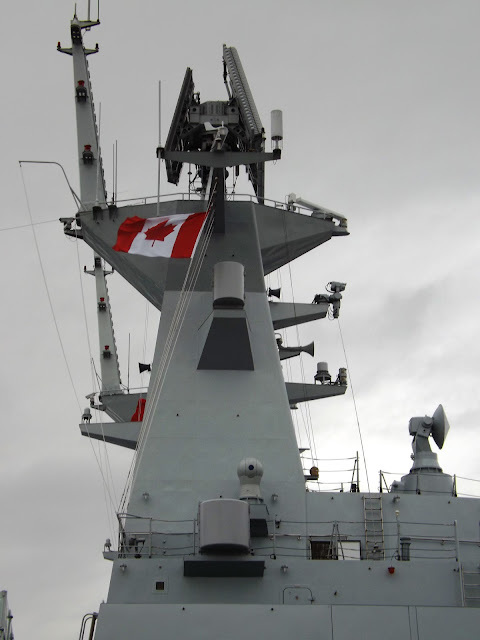 In terms of size and displacement, a comparison of the type 504a frigate and Canada’s Halifax class frigates shows that they are vessels of a similar class. Canada’s Halifax class displaces 4,770 tonnes, has a length of 134.1 m (439.96 ft) a beam of 16.4 m (53.81 ft) and is powered by two General Electric LM2500 gas turbines for a total of 47,500 shp, and a SEMT Pielstick diesel engine which gives it a top speed of 29 knots and a range of 9,500 nautical miles. The ships have a crew of which numbers 225. Halifax class ships are armed with eight MK 141 Harpoon SSM, sixteen evolved Sea Sparrow Missile SAM/SSM, one Bofors 57 mm Mk 2 gun, one Phalanx CIWS and twenty four Mk 46 torpedoes as well as six M2 Browning machine guns and a CH-124 Sea King or CH-148 Cyclone helicopter. A type 504A frigate, such as the Taihu has a reported displacement of 4,053 tonnes with a length of 134.1 m (440 ft), a beam: of 16 m (52 ft) and is powered by a CODAD arrangement of 4 x Shaanxi 16 PA6 STC diesels giving 5700 kW (7600+ hp @ 1084 rpm) each for an estimated maximum speed of 27 knots and a range of approximately 8,025 nautical miles. These ships are reported to carry a crew of 165 sailors and marines. The Type 054A (NATO codename Jiangkai II) frigates first entered service in 2007. The class is planned to comprise 24+ vessels. As of 2016, 22 are in service, 1 is fitting out, and 2 are under construction. The Type 054A carries HQ-16 medium-range air defence missiles and various anti-submarine rockets in a VLS system. The HQ-16 provides area air defence from all engagement angles up to a range of 50 km. HQ-16 launcher, with 32 cells, appears to adopt a hot launch method with the same design principle of US Mk 41 VLS: a shared common exhaust system is sited between the two rows of rectangular launching tubes. The VLS system is also capable of firing Yu-8anti-submarine missiles, a weapon believed to similar in operation to the U.S. Navy ASROC. The ships also carry 2 Type 730 CIWS. The autonomous Type 730 provides defence against close-in threats. The main gun armament is an H/PJ26 stealthy 76 mm dual purpose gun mount, which is a Chinese development of Russian AK-176. 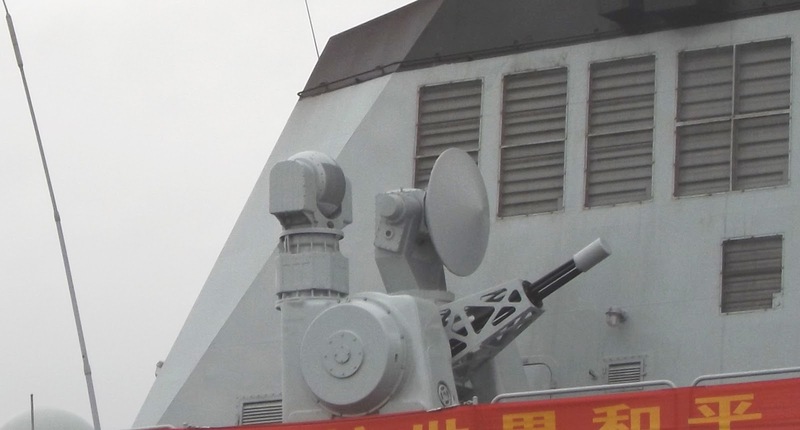 H/PJ26 utilizes advanced synthetic material such as fiber glass to achieve a lowered radar cross section and the gun is capable of a high rate of fire for air defense, including defence against sea-skimming anti-ship missiles. 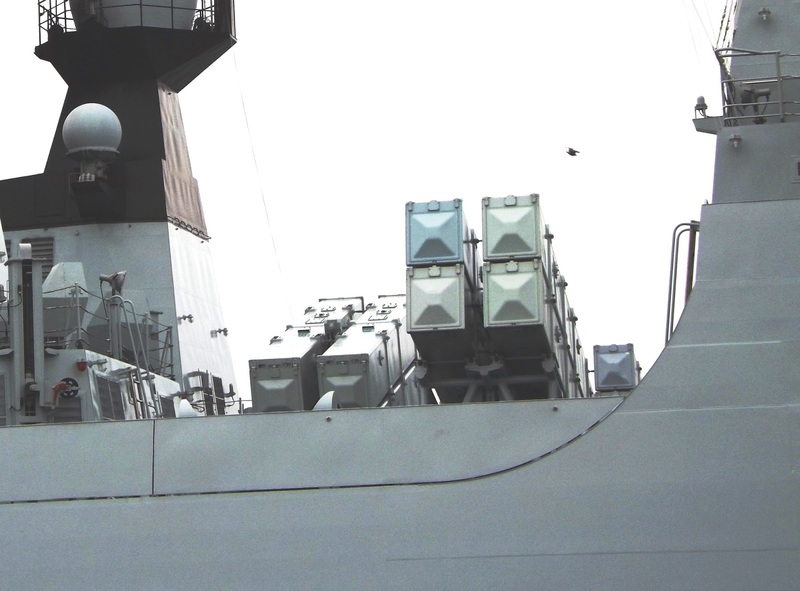 Other armament consists of 2 × 3 324mm YU-7 ASW torpedo launchers, these torpedoes are carried inboard so as to maintain the ships stealthy profile. These ships are also armed with 8 YJ-8 "Eagle Strike 83” subsonic anti-ship cruise missile. A turbojet powered anti-ship / land attack cruise missile sometimes referred to as the C-803 it in similar to the Harpoon missile, although it trades a somewhat smaller warhead for a longer range, reported to be 180km. The ship also carries 2 × 6 Type 87 240mm anti-submarine rocket launcher for a total of 36 rockets carried, an older but still effective weapons system. 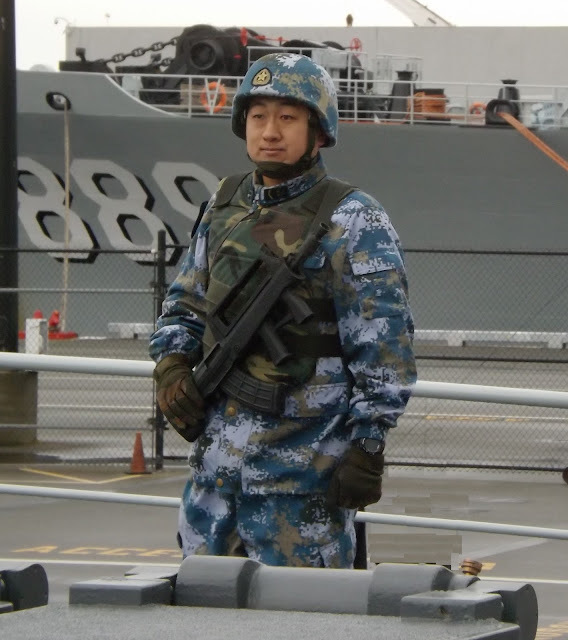 Chinese marines, equipped with bullpup Type 95 (QBZ95) 5.8x42mm assault rifles, appeared to be a part of the ships complement. It is also possible that the Chinese navy has adopted the odd US. Navy practice of wearing seagoing “camouflage” fatigues. The Taihu, like the other ships of her class, have facilities to carry 1 Z-9C ASW helicopter. The Harbin Z-9C (NATO reporting name "Haitun") is a the Chinese licensed variant of the French Eurocopter AS365 Dauphin. The naval version, introduced in the 1990s, is known as the Z-9C. As well as SAR and ASW duties, the Z-9C can be fitted with an X-band KLC-1 surface search radar to detect surface targets beyond the range of shipborne radar systems. 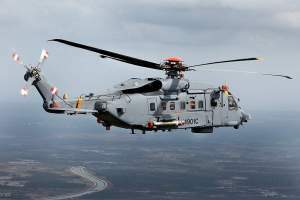 The helicopter is normally outfitted with a pulse-compression radar and low frequency dipping sonar to aid in ASW operations. With a maximum take-off weight of 4,100 kg (9,039 lb) and powered by two 632 kW (848 hp) turboshaft engines, the Z-9C is not really in the same class as the Canadian CH-148 Cyclone whose takeoff weight of 12,993 kg (28,650 lb) and powerplant consisting of two 28,650 lb (3,000 shp) each engines, along with advanced sensors and electronics, puts in an entirely different category then the Z-9C. Of course, another difference is that Z-9C’s are actually flying on active service which is more than can be said of the Cyclone. The Type 054A with a design like that of advanced western ships, such as the French La Fayette class, has a number stealth features, including sloped hull design, radar absorbent materials, and a clean profile. It is reported that the ship also features information systems (IS) for maintenance and inventory control, which automatically provides information to shore based facilities or supply ships so that parts in need can be provided more quickly. These frigates come with an impressive array of sensors and processing systems which includes: a Type 382 Radar 3D air/surface search radar, a Type 344 Radar OTH target acquisition and SSM fire control radar, 4 Type 345 SAM fire control radars, an I-band MR-36A surface search radar, a Type 347G fire control radar for the 76mm gun as well as 2 Racal RM-1290 navigation radars. ASW sensors include an MGK-335 medium frequency active/passive sonar system. 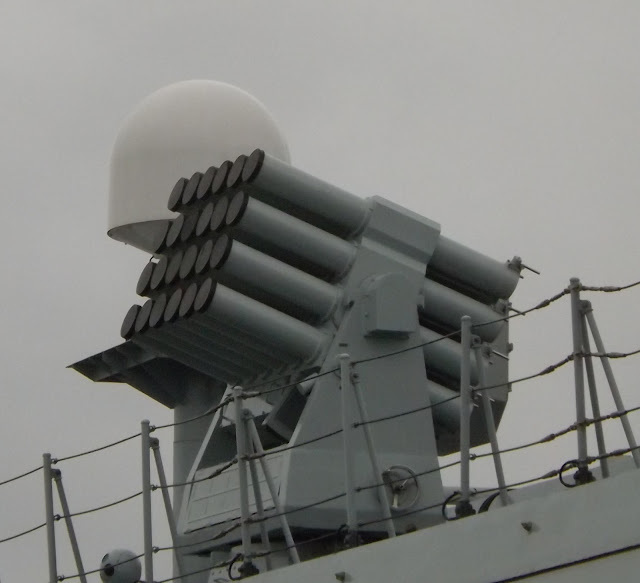 The ships include a modern combat data system in the form of the ZKJ-4B/6, which was developed from Thomson-CSF TAVITAC. Communication systems include an HN-900 Data link (the Chinese equivalent of Link 11A/B) as well as SNTI-240 and AKD5000S Ku band SATCOMs. Known electronic warfare systems comprise a Type 922-1 radar warning receiver, the HZ-100 ECM & ELINT system and the Kashtan-3 missile jamming system. Sadly the visiting Type 903A replenishment Ship, the Taihu, has no equivalent in the RCN. These Qiandaohu-class ships (NATO codename: Fuchi) have a displacement of 23,400 tonnes, a length of 178.5m, beam of 24.8m and draught of 8.7m. Propulsion consists of 2 diesels generating 24,000 hp. through 2 shafts for a maximum speed of 20 knots and a range of 10,000 nm at 14 kts. It has a capacity for 10,500 tons of fuel oil, 250 tons of fresh water and 680 tons of cargo and ammunition. These ships have a complement of 130 personal and carry an armament of 4 x H/PJ76F twin 37mm dual purpose guns. The ships come equipped with a hanger and flight deck and can embark one Z-8 helicopter or one Z-9 helicopter. By all accounts the visit to Canada by this Chinese Navy squadron was well received and attracted many visitors. The ships themselves made a first rate impression. It was the newness of the ships and their excellent condition that was so striking. It was Mao Tse Tung who said that power grows out of the barrel of a gun, but just as notable as the firepower on display was the demeanor and professionalism of the Chinese service personal. It is in the small things that one can sometimes judge abilities and so it was the complete lack of noticeable corrosion on board the ships and the traditional bosun's whistle cupped in the hand of the petty officer at the head of the boarding gangway with its suggestion that, as unlikely as it was with a crowd of tourists pushing their way on board, if an officer should show up he would be rendered appropriate honours that struck this observer as a sign of just how capable a force the People’s Liberation Army (Navy) has become. What also must have been obvious to any observer was that these ships and their capabilities exceed those available to the Royal Canadian Navy. It is not just the lack of new ships but the complete lack of any form of replenishment ship that makes it impossible for Canada to send a similar delegation to China or even hard pressed to match this squadron with a comparable force in Canadian waters.